Finish Line requires little to install. You will need to use1 anchor vice that tightens the fence at the beginning and at the end. If you need to splice two pieces together you will need a wire link. Complete installation instructions can be requested. Finish Line is a lightweight but sturdy fence. The beauty of this fence is that unlike other fences, it can be installed on existing T posts or wood posts. You can drill right through the wood post for the easiest installation. It is also so light, under 40 pounds per roll, that you do not need a tractor or any special equipment like come-alongs or spinning jennys. If you have a drill and can lift 40 pounds, you can install this fence. It has a 1250 pound breaking strength and UV inhibitors. Other monofilament fences that do not have inhibitors will crumble over time. Start your Finish-Line Safe Horse Fence installation by setting end and corner posts, and line posts. Choice of Posts – Posts should be high quality pressure treated round posts or those of composite materials. End and corner posts should be heavy duty composite posts 4 to 6 inches in diameter or round wood posts 5 to 6 inches in diameter. Line posts should be at least 3 inches in diameter. Al posts should be 7 to 8 feet long. While not recommended as preferred post material, Finish-Line Fencing can be installed on metal posts if the fencing is protected from rubbing against the metal, and the metal post is smooth. Excessive rubbing against metal posts and staples can cause Finish-Line Fencing to eventually break. If metal posts are used, choose a synthetic material to insulate and protect Finish-Line Fencing. Setting End and Corner Posts – Set each end and corner post in a hole 3 feet deep. Fill around the posts first with soil, crushed rock, or pea gravel (6 to 8 inches). 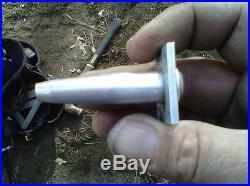 Tamp with a bar to compact the material. Next, add redi-mix cement (12 inches), or more crushed rock or pea gravel tamped every 4 to 6 inches. Setting Line Posts – Set each line post 2 1/2 to 3 feet, depending on soil conditions. Maximum spacing for line posts should not exceed 10 feet (for foals, 8 feet). Using the same post material as for end and corner posts, construct an angle support brace as follows. Mark the end post 3 1/2 feet from ground level to inducate where the bottom of the support brace will be nailed diagonally to the end post. 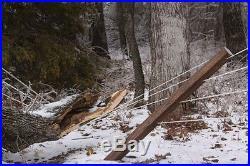 The support brace should enter the ground approximately 3 1/2 feet from the end post, and be anchored in a cement pad (20″ x 20″ x 6″) or anchored with a redwood stake (4″ x 8″ x 18″) driven into the ground against the brace. If available, channel iron 6 to 8 inches wide by 18 inches long can be used. 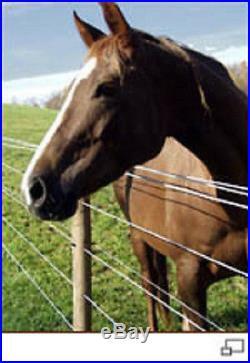 Attach Finish-Line Horse Fencing to braces in the same manner as line post strand attachment. If through-the-post installation is used, drill holes through the support brace for lower fencing strands to pass through to the end post. Finish-Line is an easy to use synthetic product developed by Bayer. This fencing is strong, flexible and can be visualized easily from long distances. Virtually no maintenance is required if installed correctly. Effect of light and weather. Finish-Line fencing is designed with ultra violet inhibitors, making it stable in extreme weather conditions. It will not break down from exposure to sunlight and extreme heat. In the case of a brush fire, Finish-Line will melt, allowing the horses to escape harm. Unlike wire fencing, Finish-Line horse fencing contains no metal, so there is no danger from lightning or lightning strikes. Highly resistant to alkalis, acids, seawater, and sweat; including acidic soils and crop chemicals. It will not rust, rot, or corrode. Reaction to organic solvents. Resistant to diesel, petrol, paraffin, paint solutions and paint thinners, fat, oil and dry-cleaning agents such as perchlorethylene. 40° F and 122° F. Running Length per Spool. The item “Finish Line Fence 2000ft Safe Horse & Livestock Fence and Installation Kit” is in sale since Wednesday, September 23, 2015. This item is in the category “Sporting Goods\Outdoor Sports\Equestrian\Other Equestrian”. 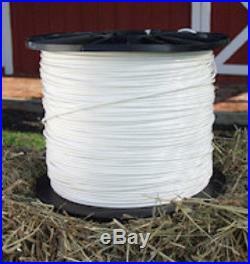 The seller is “timcosupply” and is located in Edmond, Oklahoma. This item can be shipped to United States, Canada, United Kingdom, Denmark, Romania, Slovakia, Bulgaria, Czech republic, Finland, Hungary, Latvia, Lithuania, Malta, Estonia, Australia, Greece, Portugal, Cyprus, Slovenia, Japan, China, Sweden, South Korea, Indonesia, Taiwan, South africa, Thailand, Belgium, France, Hong Kong, Ireland, Netherlands, Poland, Spain, Italy, Germany, Austria, Israel, Mexico, New Zealand, Philippines, Singapore, Switzerland, Norway, Saudi arabia, Ukraine, United arab emirates, Qatar, Kuwait, Bahrain, Croatia, Malaysia, Brazil, Chile, Colombia, Costa rica, Panama, Trinidad and tobago, Guatemala, Honduras, Jamaica, Antigua and barbuda, Aruba, Belize, Dominica, Grenada, Saint kitts and nevis, Saint lucia, Montserrat, Turks and caicos islands, Barbados, Bangladesh, Bermuda, Brunei darussalam, Bolivia, Ecuador, Egypt, French guiana, Guernsey, Gibraltar, Guadeloupe, Iceland, Jersey, Jordan, Cambodia, Cayman islands, Liechtenstein, Sri lanka, Luxembourg, Monaco, Macao, Martinique, Maldives, Nicaragua, Oman, Peru, Pakistan, Paraguay, Reunion.